If you're interested in Phoenix history, you know about Hattie Mosher. If you're just getting started, you'll meet her. You can't miss her. You can Google information about her, but like most stuff on the internet, there's just too much, so I'll try to explain her briefly here. The Lount Ice Plant in 1905, Phoenix Arizona. This is where Hattie's fortune came from. Sam Lount was her dad. The first thing that you need to know about her is that she lived in Phoenix and inherited a lot of wealth from her father. I won't do the "equivalent to today's dollars", but it was a ton of bucks. Her dad sold ice in Territorial Phoenix, so you can imagine that he made a LOT of money. So she inherited a ridiculous amount of money, and land, too. 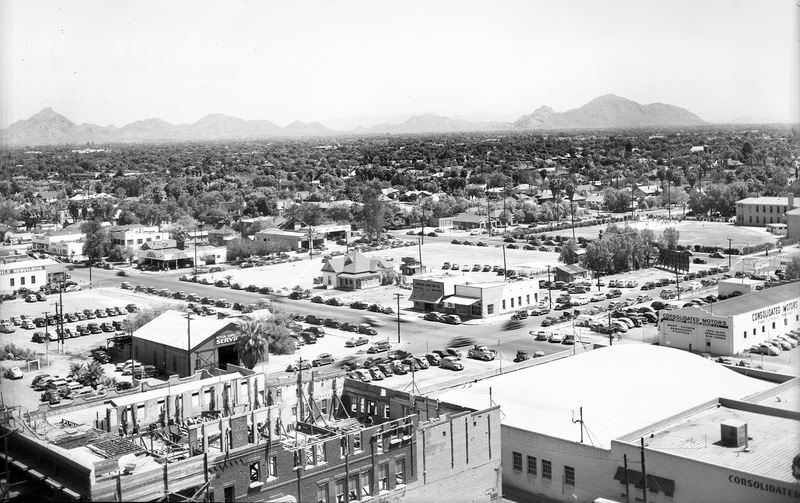 The land she inherited included several square blocks of what is now downtown Phoenix, from Central to 2nd Street, and from Taylor to Van Buren. Her house was there, right in the middle of where the ASU Law Building is now, between Taylor and Polk, between 1st and 2nd Streets. Looking northeast towards Camelback Mountain in the 1940s, Phoenix, Arizona. Hattie's house is right in the middle of the mostly empty lot. I'd like to start with the end of her life, which was tragic. It's sad for anyone to die in poverty, and that's what happened to Hattie. She died of malnutrition at age 82, after having squandered all of her money. She wandered the streets of Phoenix. I have a neighbor who remembers seeing Hattie back in the early forties. Hattie would walk around downtown Phoenix, and apparently was a scary sight for a little girl to see. My neighbor remembers vividly that Hattie always wore an old-fashioned dress, and bright red lipstick. Hattie had a lot of money, but she didn't like to pay taxes. She didn't think the streets should be paved, for example. She fought City Hall for years, and eventually City Hall won, and started paying off her property to pay for back taxes. By the time Hattie died, her fortune was gone. If you remember back to the 1940s, you may remember a building that was always "under construction" at Central Avenue and Taylor. 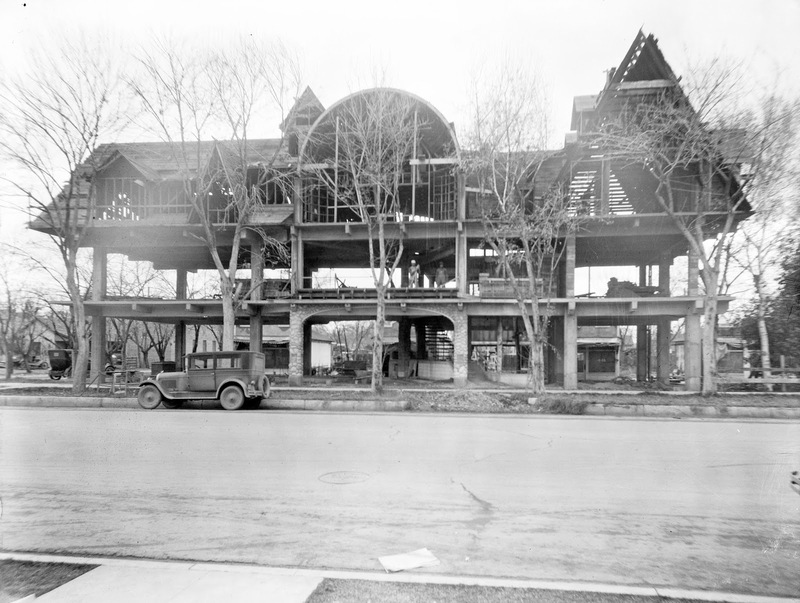 It was to be a hotel, but it was never finished, and people in Phoenix called it "Mosher's Folly". And if you remember the old Ramada Inn in the 1970s, you may remember that the restaurant and bar there was called "Hattie Mosher's", which was a smile and a wink to the fact that it sat on the property where Hattie's house had been. The Ramada Inn in the 1970s, 1st Avenue and Polk. Note the name of the bar, which was Hattie Mosher's. Image at the top of this post: Hattie Mosher and her bicycle. 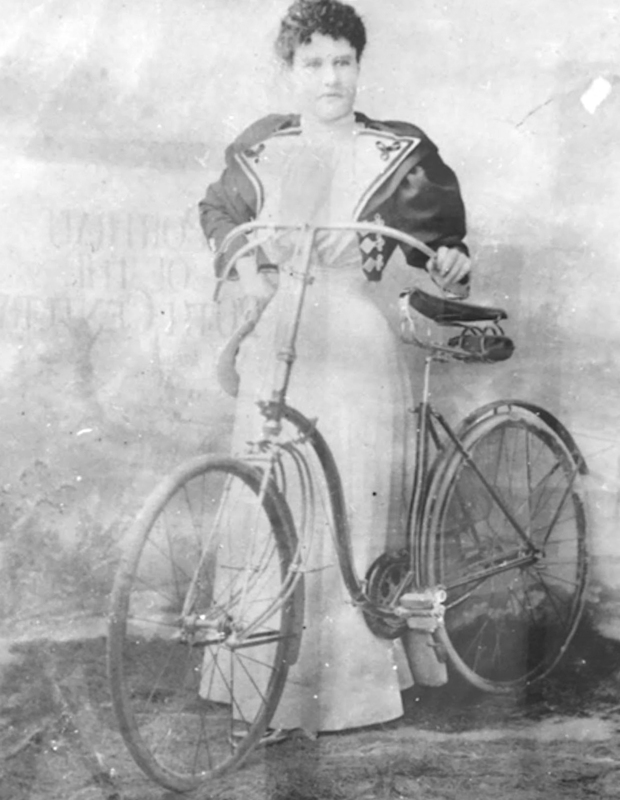 She was one of the first women in Phoenix to ride a bicycle in public, and it was scandalous. Note that women's bicycles were designed without a crossbar, to allow women to ride while wearing a dress. Girls' bikes are still designed that way.